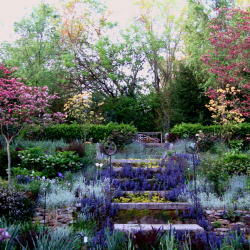 It is absolutely beautiful in your garden! Hi Leslie, thanks so much! Wish you could see it in person. Thank you for making my heart happy with your kind words. I am glad the flowers were able to help. Wow Frances, its a regular Tonal Hootenanny out there!!! So happy and lively…. that’s what Spring is all about! All greens go together and all colors go with green. I have it on good authority that when G-d was tired of designing the rainbow, the angels, said, Boss (or Ma’am) , just throw all the colors out there and see what sticks….. So there you have it. 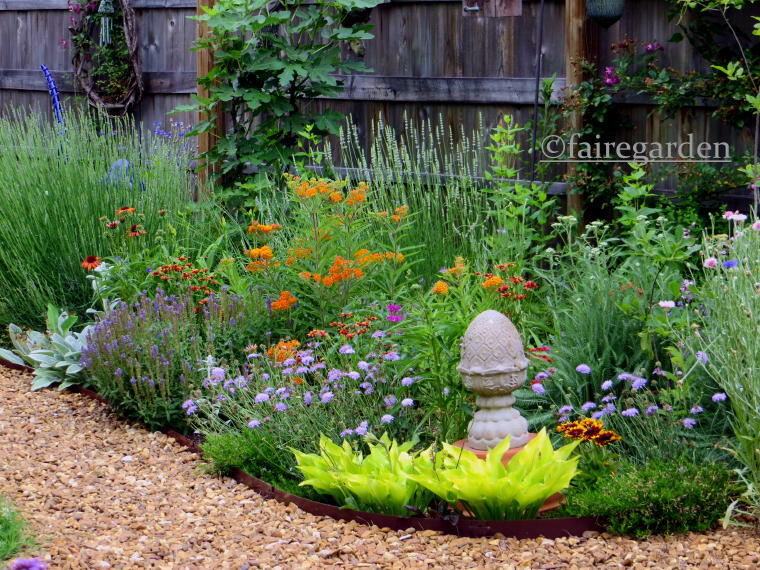 Thank you for sharing your garden, I just love love the effect of the gravel and the dark fence. 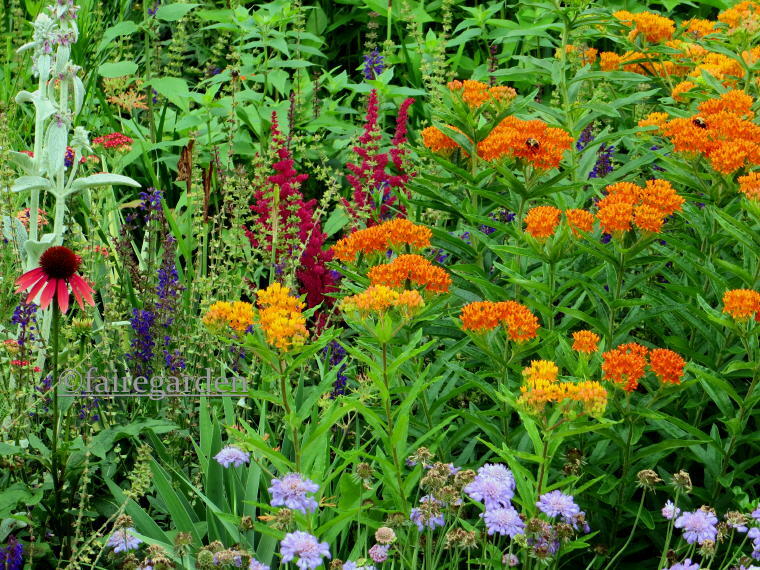 They highlight the plantings beautifully. Here in CT for some reason, the winter was good for blooming trees and shrubs and everything has been blooming mightily, much more so than previous springs. I can’t believe you have lilies already, wow. Onward and Greenward! So much to love about your comments, dear Marguerite! You really have a gift with words. Tonal Hootenanny made me snort! I am happy to hear your trees and shrubs decided to put on a good show. Some years are good, some are less so, it seems. Our flowers are about two weeks ahead of normal, although normal is just a figment of a dream anymore. I am totally of the same mind about all colors in nature going together, have been beating that drum ever since I started blogging in 2007. A rainbow for my eyes on this dreary day. We have the green in between the last of the daffodils and the beginning of the columbines, dianthus, iris etc etc. Orange is a lovely color, just have to find the right partners. Hi Kathy, I am glad the flowers could color your world! I have been trying to keep something colorful going everyday of the year, whether it is foliage, berries or flowers. It is difficult but a worthwhile pursuit. 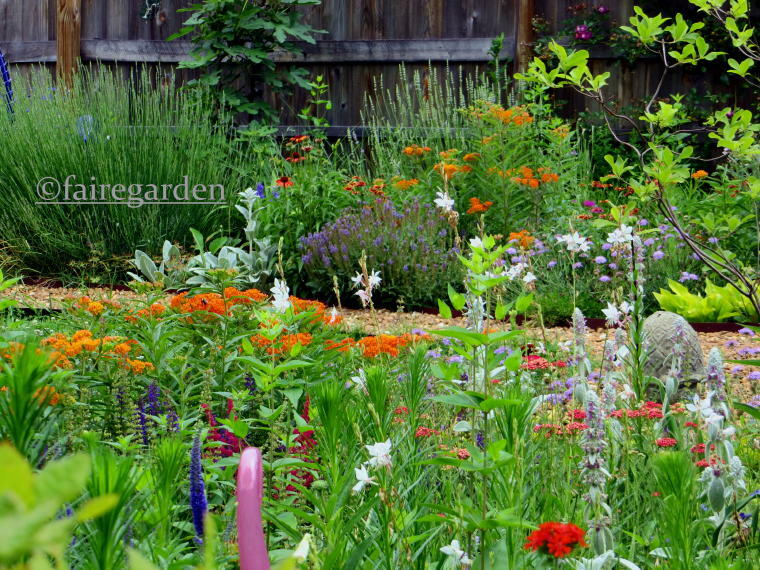 Thank you so much for sharing your lively, energetic garden with us. I have been debating whether to start a new bed this year. My back says “no” and my heart says “yes.” The result was a 50-50 tie. 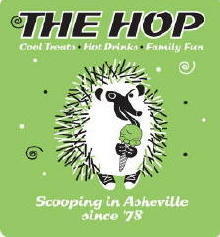 Your photos just tipped the balance in favor of going for it! Thanks, Alice. I am happy to enable your new bed! Just don’t make it too large and leave a path for you to get in there to weed/plant/etc. comfortably. Maybe on a bench or stool. That really helps the back issues. Good luck! 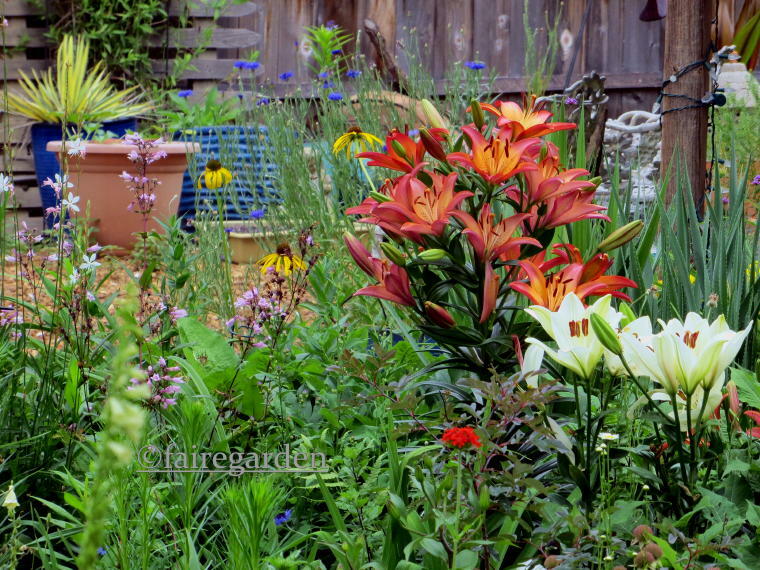 So lovely to see your colorful garden, Frances. It looks like it has really progressed well since you moved in. I’ve been turning over the garden paths trying to get the weeds and grass out, then putting down cardboard and pine bark nuggets over that. Slow progress but it makes such an improvement to the garden view! i’ve just rested up watching 1/2 inch of rain fall – I loved that it made me quit for the day. Many of your flowers seem to be ahead of mine in NE Alabama, though we had an absolutely wonderful early spring. Happy gardening to us both! Hi Barbara, thanks for visiting. Good job on the path weed project. That is a good way to get rid of the weeds and make it neater, for a while. Nice on the rain, too. We are mostly ahead of schedule on the blooming, but it will even out come summer. Happy gardening! Wow, wow, wow! That is a gorgeous combination of plants. Love it! Hi Carol, thanks so much. The garden in back is looking pretty good at the moment. I look forward to seeing this Fairegarden one day! It’s a glorious rainbow indeed. Hi Dee, thanks for those kind words. Lamb’s ear really fits in well with any color. That sun you are talking about fades pastels into no color at all. We need bright and bold. Thank you so much, Gisela. What a lovely name you have! Thank you for your continued support, Lola! 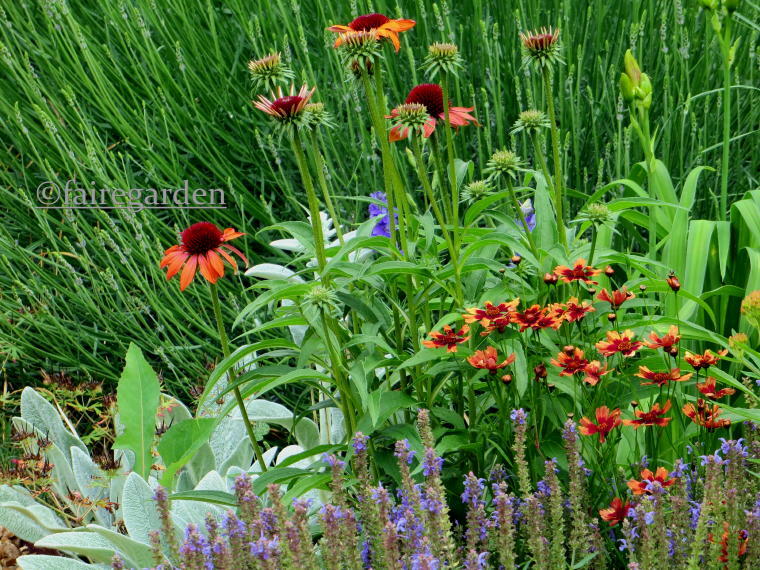 We are still in the cool of spring colors here so it is particularly delightful to see it hot in your garden. It looks so very fresh and healthy. Love those lilies. Sigh, the lily leaf beetles love my lilies and I am just not diligent enough to pick and stubborn about spray. I will admire yours from afar. Hi Layanee, thanks for stopping by. Grrr to the lily beetles. I picked off some kind of bug that was eating the lilies several weeks ago. Never saw another one. Hope it was just a scout and no more come down here. Enjoy your beautiful cool spring! So beautiful! I have more shade every year and I fear my colorful springs are over. My lovely columbines didn’t even show their faces this year. Oh no, Jill! That must be deep shade for the columbines to not bloom, although our spring was very weird temperature wise. Thanks for visiting. absolutely beautiful! such an artst you are!!! Thank you, what a sweet thing to say! 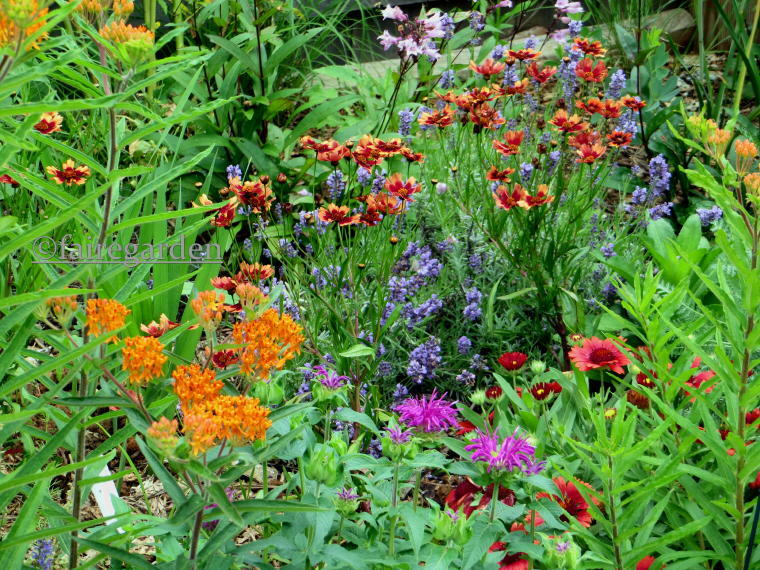 I loved seeing all the bright colors in your garden! I have Royal Sunset lily here too, but it ‘s not even close to blooming yet. Our spring has been cold and wet. Hi Alison, thanks for the kind words. Our spring was both cold and wet sometimes, and hot and dry. We are two weeks ahead of when things normally bloom. Not sure how that will affect the rest of the season, but it’s nice to see the flowers. Hubba Hubba on the hot colors! 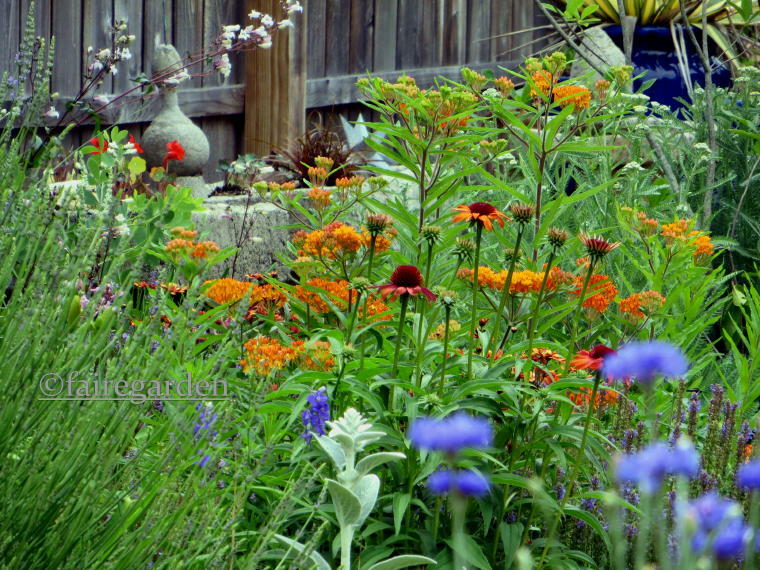 I have found that the older I have gotten, the more I appreciate the pop of orange colored flowers in the garden. 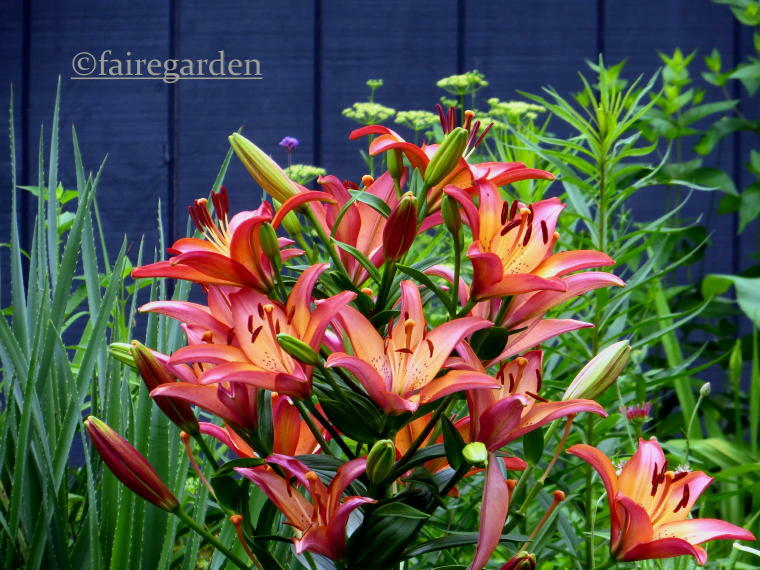 Love your ‘Royal Sunset’ asiatic lily…it might have to be in my fall bulb order. And, by the way, it looks like the hosta ‘Sunpower’ must really tolerate a lot of sun…I guess it is aptly named. Hi Michaele, thanks for visiting. We get wiser as we mature! HA The *royal* lilies have all been wonderful. 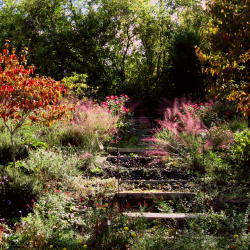 Last fall I planted Royal Kiss, a very dark red. It bloomed earlier and I hope in the future it will bloom along with these. Sunpower can take direct sun if watered. Hi Valerie, thanks for stopping by. I love all the colors. A tapestry in full summer colors. Gorgeous. Exciting. Inviting. Hi Lisa, thanks for the kind words. The garden is a beacon of brightness right now. I love it. Gorgeous! 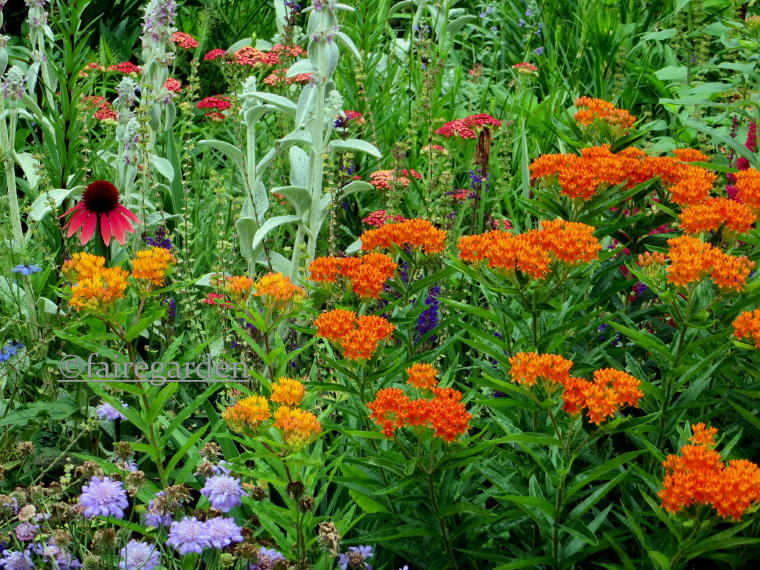 It seems like summer, not spring, in your garden with the wonderful butterfly weed, and cone flowers, and lamb’s ears. They bloom much later in z4 I guess. Striking combinations whether planned or not. I have that same hosta who suffered last year from our dry, hot summer but is a stunner right now in the garden. Hi Kathy, thanks for stopping by. 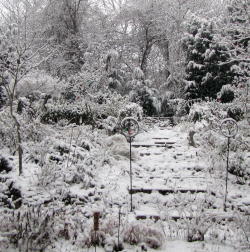 It is zone 7a here, so we are a month or more ahead of you at this time of year. You will catch up quickly though. It makes for a different combination of things blooming at the same time. The Sunpower hosta needs more water when it gets super hot and dry. I will try to meet its needs this year, unlike the last couple. Beautiful! You do inspire me, Frances. Thanks, Vicki. You are too kind. 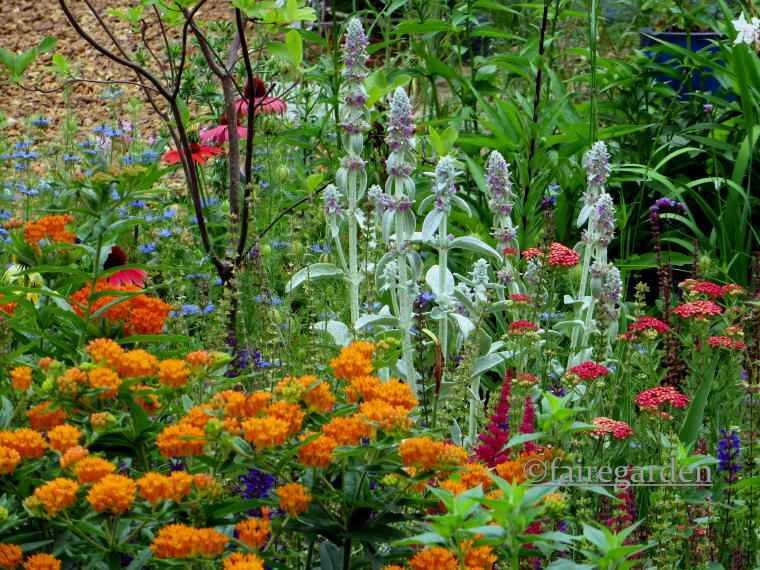 I’m a huge fan of color, in my garden and my home, so naturally I’m a fan of this. In spring, all around are pastels, but summer brings more color to the party. I’ve been known to call this style of gardening “clown pants”, said with great affection because I use it myself. Well done Frances.